I wanted to do something cute to label people's drinks for our party last weekend. We were hosting a lot of kids and was anticipating a lot of wasted drinks & inadvertent germ sharing. I again went searching on Pinterest and found some cute ideas. The problem was I didn't have a few important supplies for creating most of the ideas I liked. For that reason, I left it to the last minute. Create the tags in the shape that you choose. I used my Cricut. You could use a punch too. 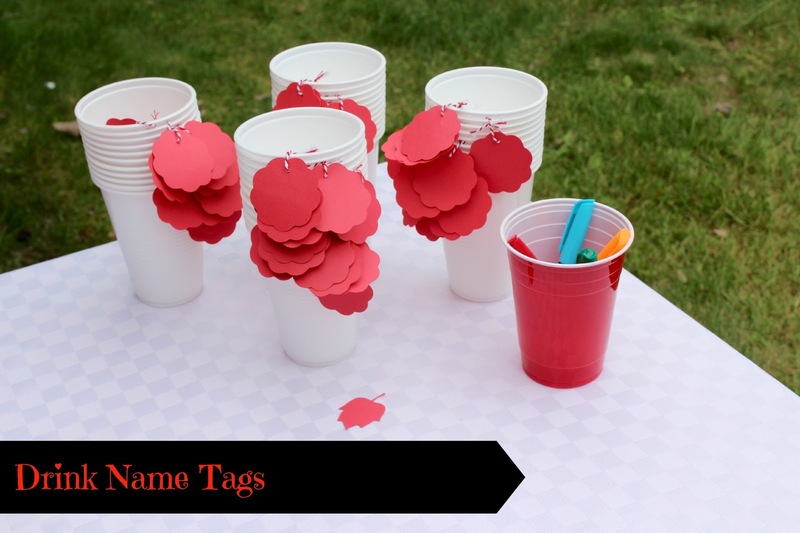 Punch holes in the tags and in the cups, then just tie them on. That simple. Look how GREAT these look! The kids likes using the different coloured markers to make their tags! This was so much cuter than just writing on the cups too!